American football is not the first thing that comes to our minds when thinking of the printing and packaging industries. But thanks to the Kansas City Chiefs this might change in the future. 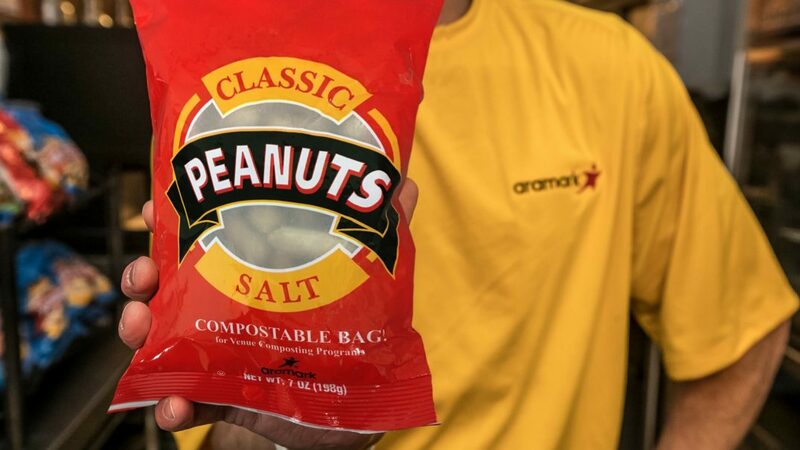 Their home venue Arrowhead Stadium is the first-ever professional sports location to sell peanuts in compostable snack packages. As part of their environmental initiative, Extra Yard, the American football team cooperated with BASF, Aramark and Hampton Farms. Their activities aim to devise and implement new green policies as well as to raise awareness for the sustainability efforts at Arrowhead Stadium. In November 2017 the time had come finally: The compostable peanut bags went in sale and are going to be offered throughout general concessions and in-seat vending as of now. Since then more than 15.000 bags of peanuts were sold in concessions at Arrowhead Stadium each year, it was no surprise that the partners decided to kick-off their project with this crispy snack. stresses Carl Mittleman, President of Aramark’s Sports and Entertainment division. Breakthrough for Compostable Packages in Sports? But business comes before pleasure and so it took 18 months of development to finally launch the new compostable bags made from BASF’s certified compostable ecovio® biopolymer and Epotal® adhesive. The initiative even thought of the consumers. Not only does the price remain the same as for the peanuts offered in the on-recyclable material. Also, he fans can discard empty bags at compost bins in the stadium or leave them under their seat. After a pilot phase , he compostable packages are likely to expand to other areas of the Arrowhead Stadium.